Our Gillette dentists are committed to making sure you have a smile you can feel good about. Through implant dentistry, we can ensure that missing teeth don’t hamper your ability to smile, allowing you to enjoy your favorite foods with confidence. Ask Drs. Hokanson and Bouzis how they can help restore your smile through implant-supported teeth replacements. Schedule your consultation today! As a general dental office, our focus is on ensuring your smile is aesthetically pleasing and functional by providing natural-looking restorations. Working in collaboration with Rapid City oral surgeons and periodontists, who are knowledgeable in precise implant placement, our dentists coordinate your treatment plan and finalize your new smile in our office. Before beginning your treatment plan, we evaluate your health and determine bone density to support best results. In some cases, our experienced dentists can even provide implant placement without a referral to an outside specialist. 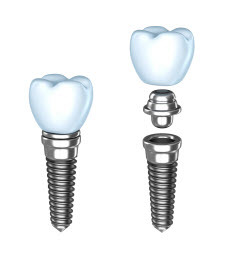 Implants provide the most ideal and natural way to replace teeth, both in terms of how your teeth look and how they help you bite, chew, and speak. As a teeth replacement solution, implants are some of the longest lasting prosthetics you can invest in. Their longevity comes from the way implants are placed, directly into the bone, and that they integrate with surrounding tissue, to act like our real teeth. If you require care for missing teeth and don’t want healthy, existing teeth prepared for a bridge, implants are an ideal option. If you’re missing all or most of your natural teeth, you aren’t stuck with uncomfortable prosthetics. 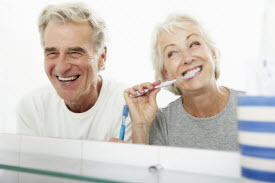 Fixed dentures in Gillette from our doctors provide you with the full smile you’ve been hoping for, without the discomfort of loose and ill-fitting teeth. To learn more about dental implants for single tooth replacements, multiple missing teeth, or even to affix permanent dentures, contact our team today for your consultation and exam.